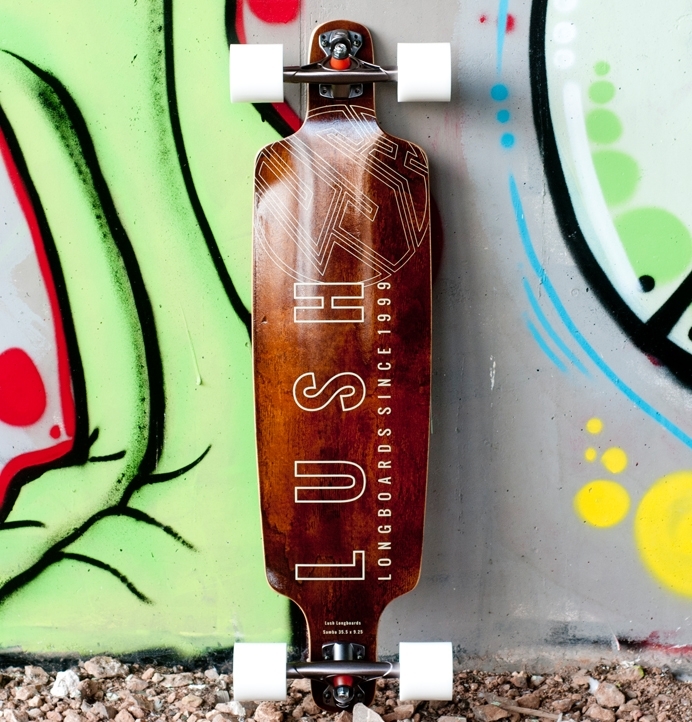 Longboard that Carves like your Snowboard | Lush Samba | 35.5" x 9.25"
The ultimate freestyle carving machine is back! Designed specifically to emulate the feeling of deep powder turns on a snowboard or cranked bottom turns on a surfboard, the Lush Samba has a legendary cult following (you’ll find quite a few in the “Riders Rides” Lush Owners Gallery). We’re stoked to bring you a re-imagined version for 2017. 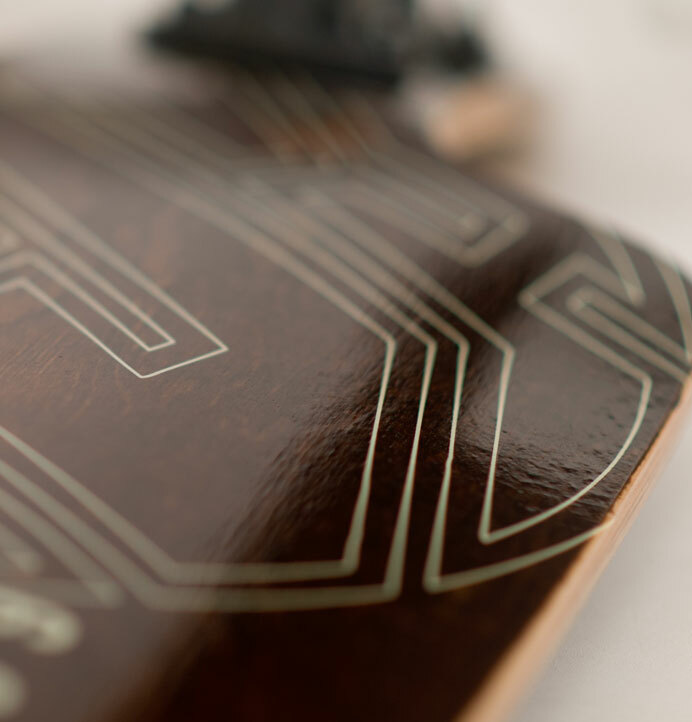 The Samba is a skateboard for surfers and snowboarders who like to carve. 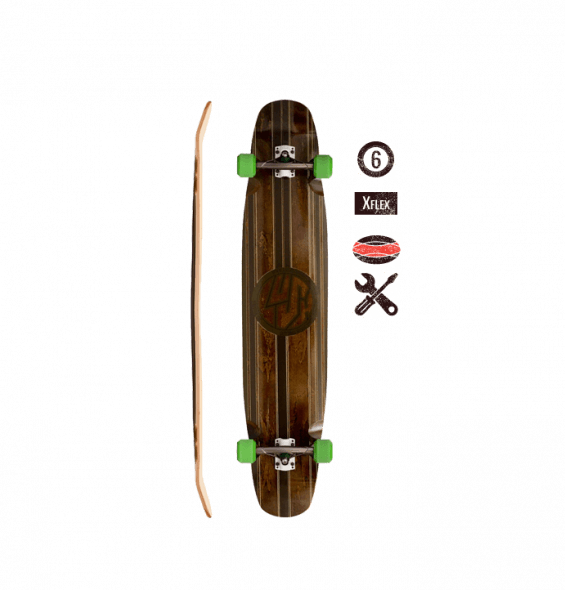 It’s not really like other longboards – the deck is designed to alter the truck geometry in such a radical way that the board just doesn’t skate like anything else with wheels. 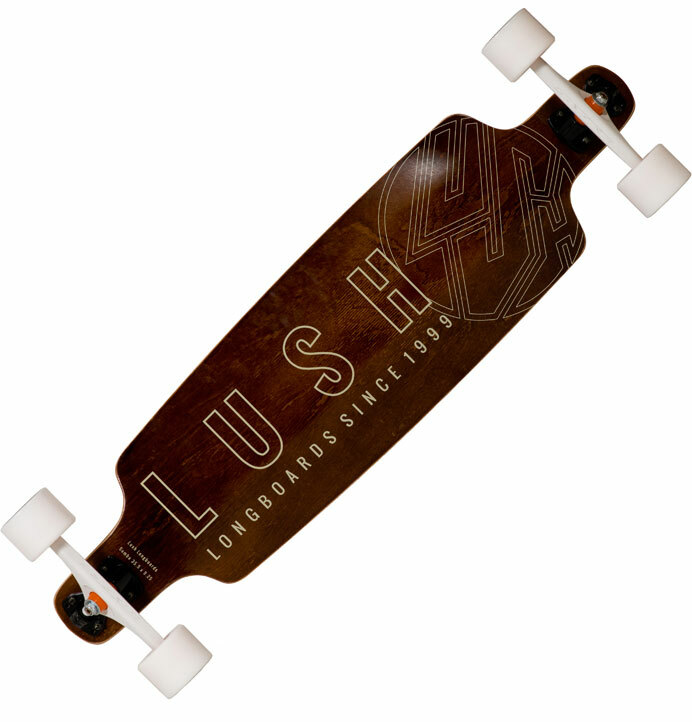 By lowering the trucks into the deck and mounting them at an angle on the very nose and tail, we have created a very turny, very leany ride which really does feel just like smashing some powder or the lip of a wave. The unique ride feeling is really the reason for the Samba’s cult following, and is the product of many years of noodling about with trucks, bushings, angles and decks. The latest incarnation of this legendary setup has a little more concave than the original carving versions to give you a little more grip for your feet, but not too much – it’s still comfortable as a pusher/commuting setup. The shorter overall length contributes to the overall maneuverability, and makes the deck easier to carry around and sling under your desk/in your locker. We’ve tweaked the standing platform and shape to avoid wheelbite even at maximum lean. 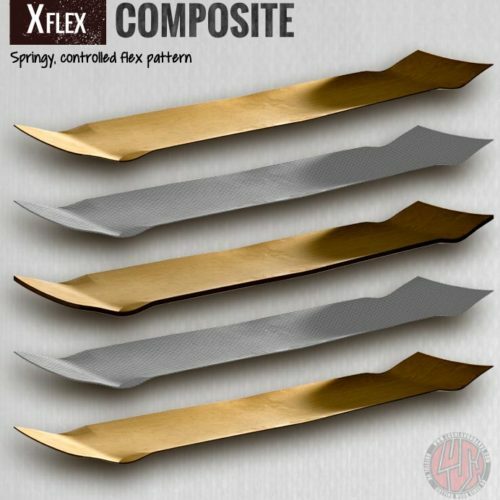 We use our X-Flex Composite construction in this board. 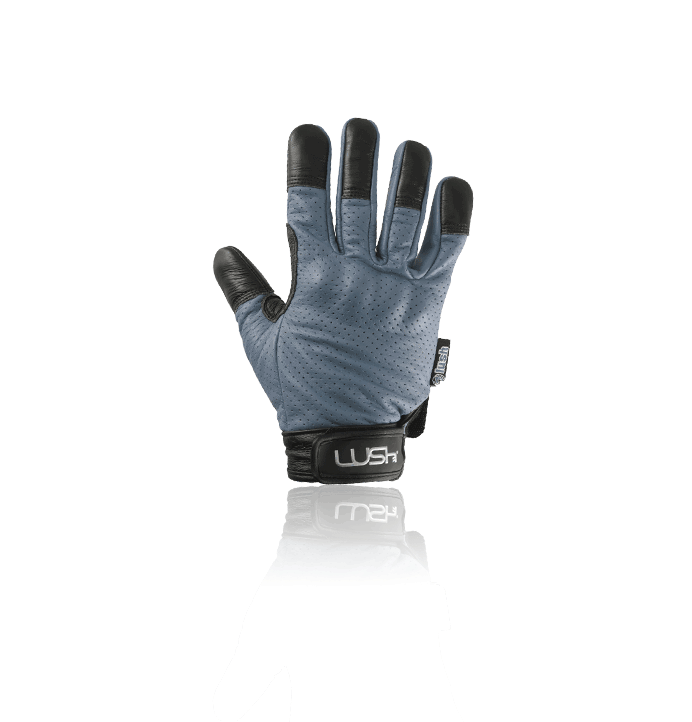 It’s thinner and lighter than the original Samba, with better energy return from every carve. As every veneer is soaked in epoxy prior to pressing, the deck resists rail impacts better, too. Fans of the original Samba will know that it was all about the super loose low angle Seismic trucks, mounted on the kicks. We weren’t happy with Seismics for a number of reasons, but since those days we haven’t found anything else that works as well. After trying countless setups over the years, we had pretty much given up, and consigned the Samba to the “heroic failures” section of the workshop. Following increased demand for this board over the last year, we had another go, and discovered that flush-mounted low-angle Sabre Forged Baseplates with super-soft bushings not only re-created the crazy carving feeling of the original – but they actually improved it! We found that Sabres mounted in this way had a smoother, more fluid turn, but without the various kingpin-and-spring-falling-out issues that we’d found with the Seismics. A few prototypes later, we’d steepened up the kicks a few degrees and shortened the wheelbase a touch, and hey presto, the Samba was back: turnier, leanier and carvier than ever! 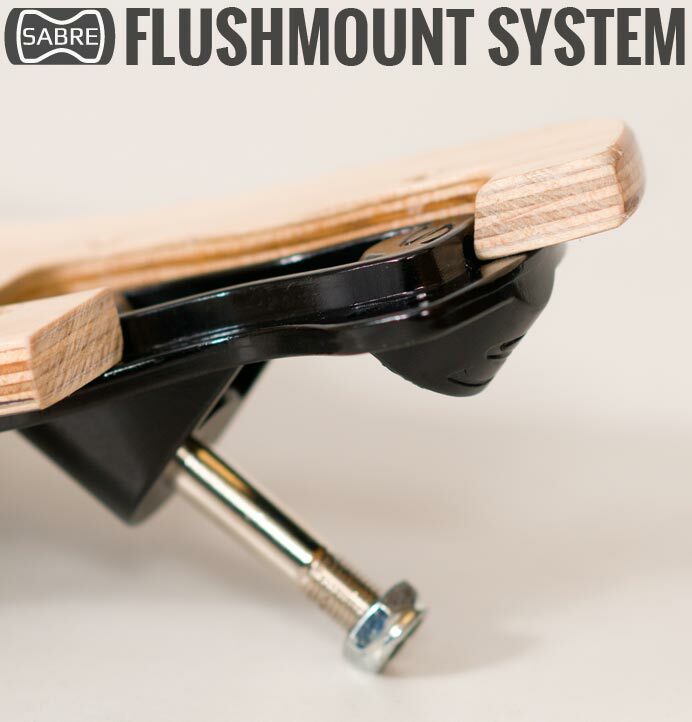 Check out this page on the Samba Flushmount System for more info. The Samba is made for carving addicts everywhere. 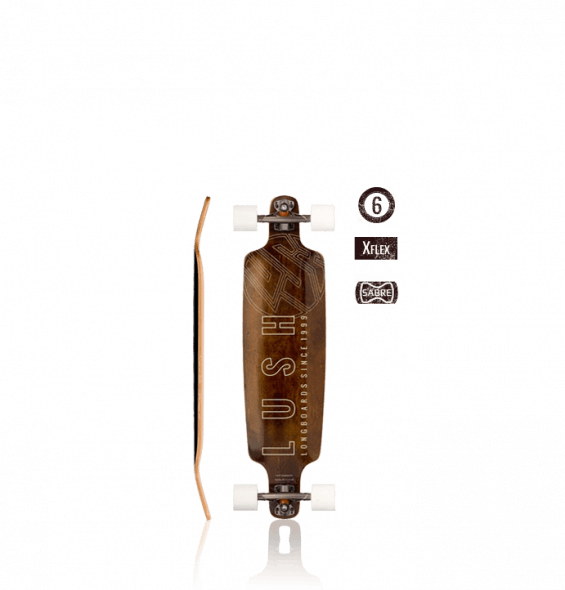 No tricks, stunts or speed required… this board just loves to turn like crazy. If you can’t get enough of the snow or waves, and you want the same feeling you get riding your snowboard or surfboard, this is where to get your carving fix! 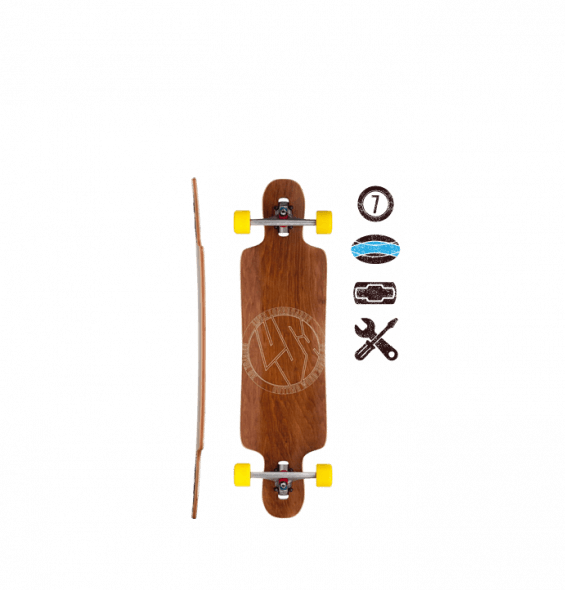 Question: Can I buy this board as a deck only? - We're sorry but we usually only offer the Samba built as a complete. The whole ride is built around a very specific truck setup, and we want everyone to experience the carving feeling the way it was intended. We have not really found another truck combination that works as well as this. Higher angle trucks don't work well at all. 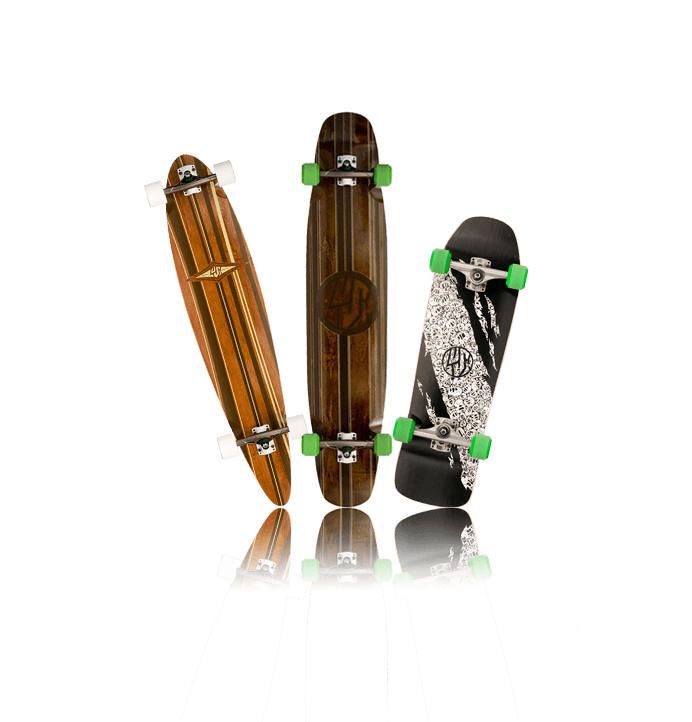 Question: How does the Samba compare to a Carver Skateboard or "Surfskate" board? - Even though they're both trying to replicate the feeling of riding a surfboard, they're radically different setups. 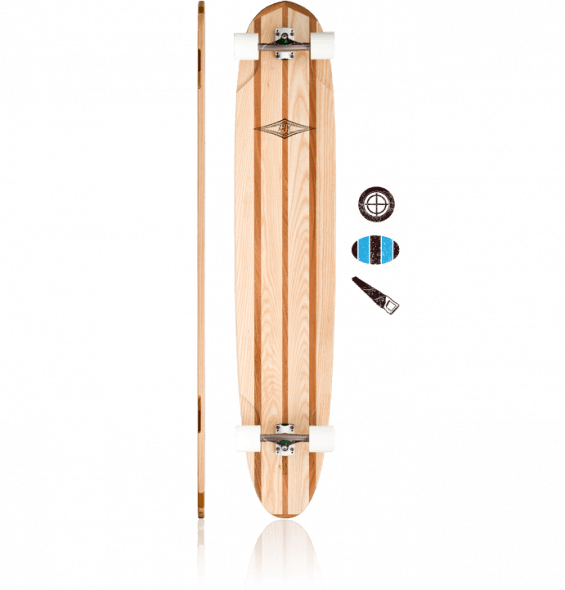 The Carver Skateboard is a medium mini-cruiser board shape that uses a regular street truck in the rear and a "Carver Truck" at the nose. 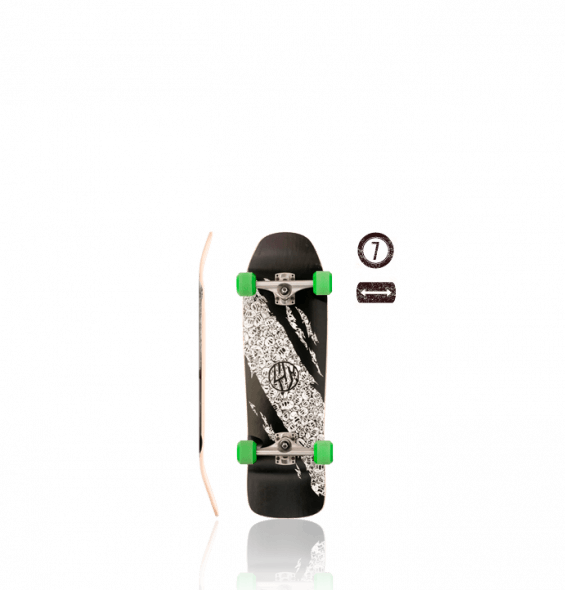 This is essentially a regular skate truck mounted on a castor - like a shopping trolley - the idea being that the front of the board can turn like crazy, while the back of the board acts as the pivot. 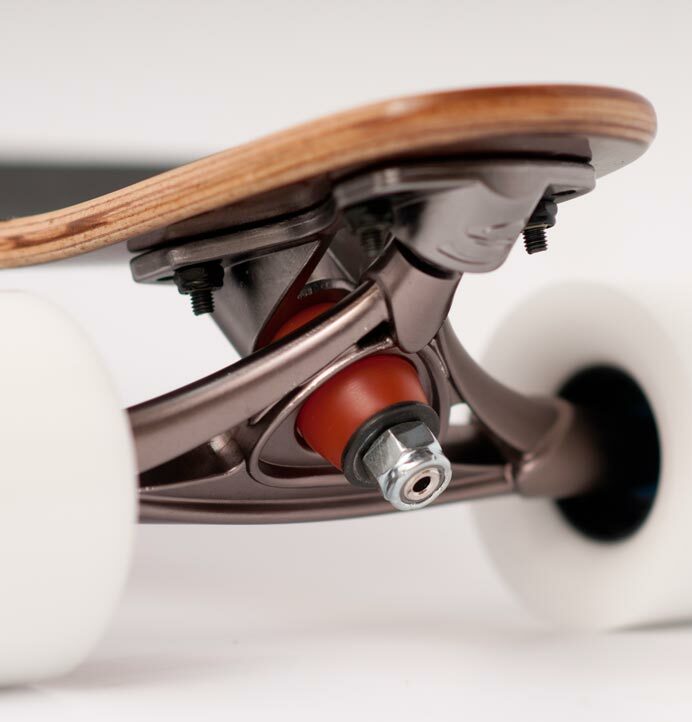 The Samba is a different approach to the surfskate skateboard concept entirely. 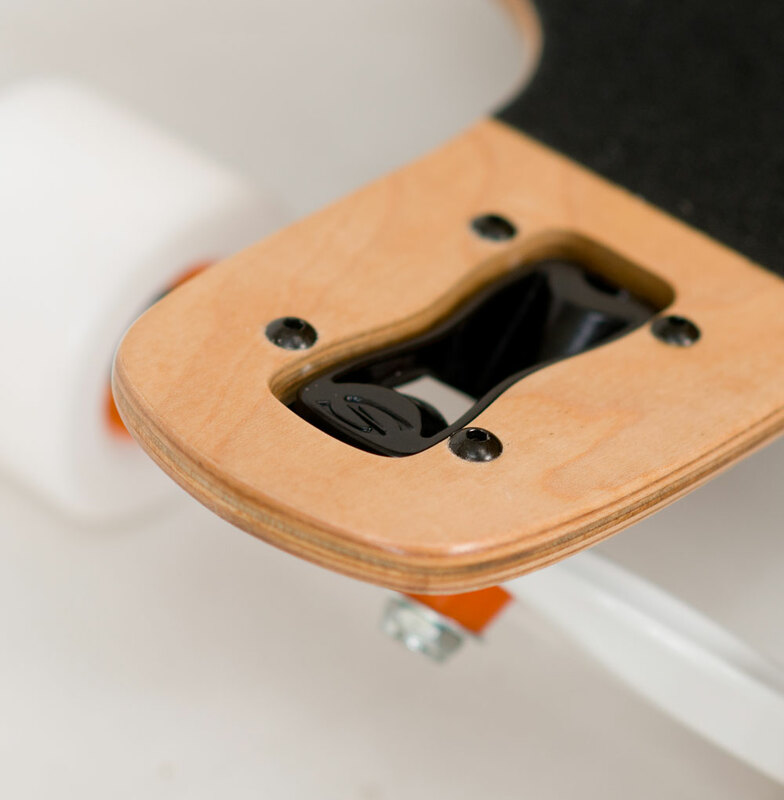 Rather than using a surfskate truck paired with a regular street truck, we've specced a pair of longboard trucks and altered the geometry and pivot position with the deck profile, with the sole aim of creating maximum lean and turn throughout the whole board. 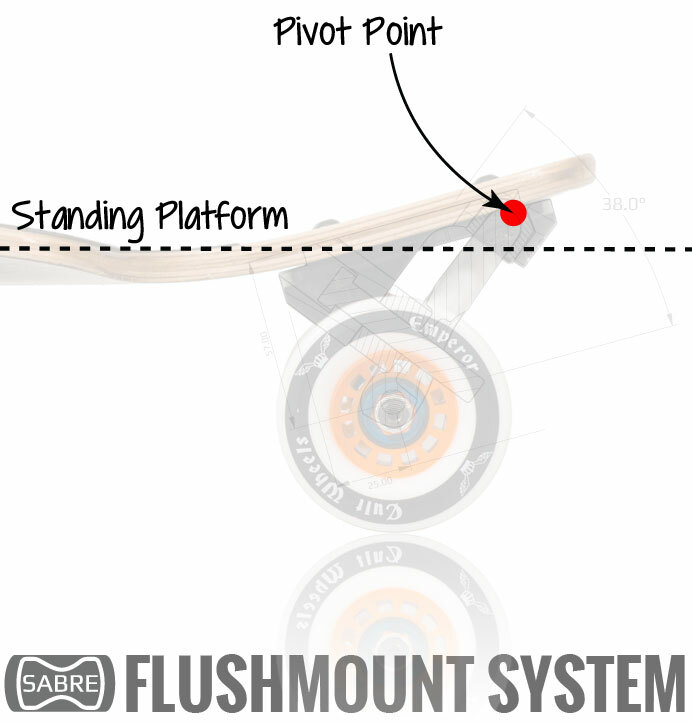 As a result, the Samba "leans," while the Carver Surf Skate "pivots." For us, the leaning feeling is an essential part of carving hard on a surfboard - there's no better feeling than cranking the board over and digging a rail in. 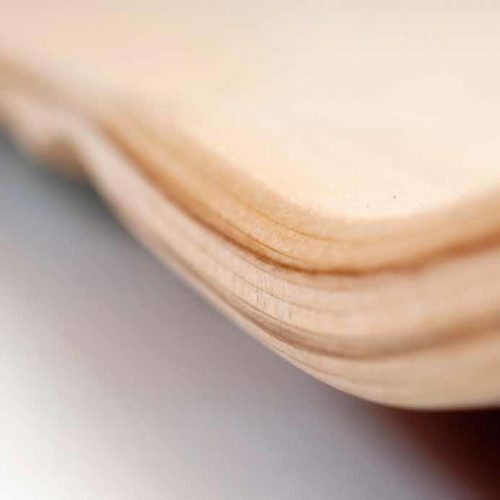 There are many other differences too - the Samba has a lot of energy return from carves due to the composite construction, whereas Carver boards or "surfskates" tend to be just maple. That same construction, paired with the larger wheels, also gives a smoother, faster ride. 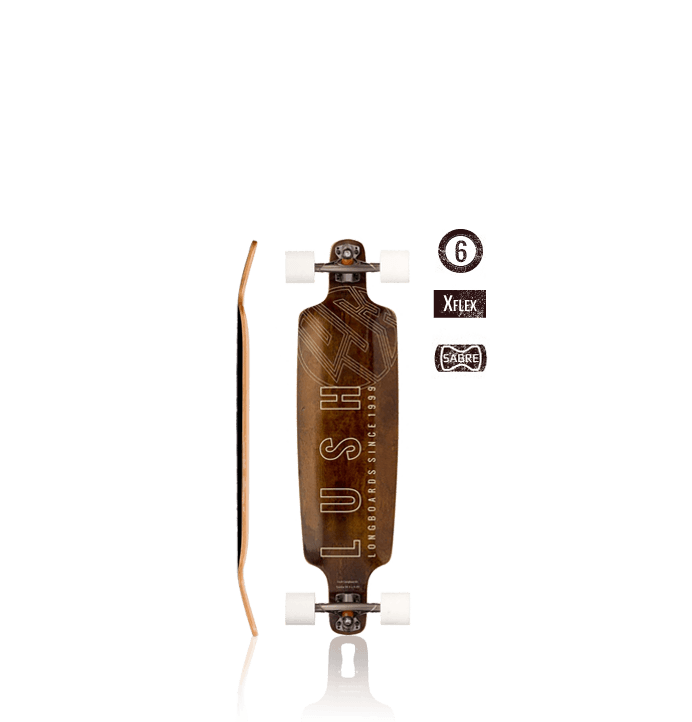 Most surfskates have a very high ride height due to the extra castor pivot under the front truck - the Samba is super low and therefore way more controllable and easy to push around. 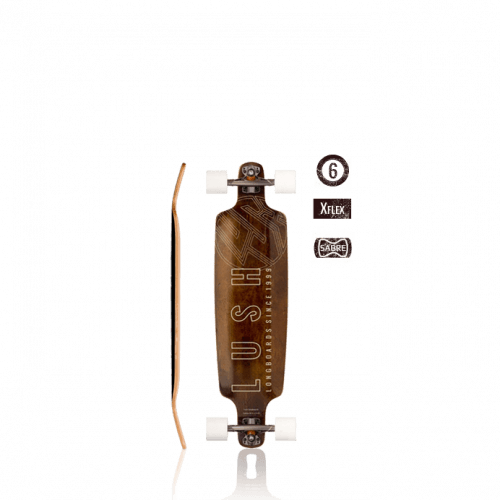 Those Carver Trucks also add a lot of weight - despite being a bigger board, the Samba is lighter than a lot of surfskates and "skate carvers." We believe that if you want to pivot, you should get a board with a kicktail and learn to skate off the back foot, not the front foot... if you want to lay down some fat, rail-to-rail surf style carves, the best carving board out there is Samba! 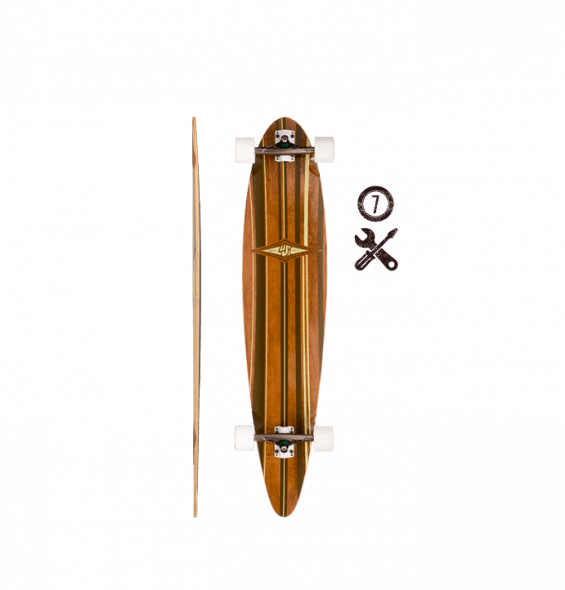 Question: I've got an original Samba longboard. Should I upgrade? - It's a fair investment - but we think there's enough differences between the 2017 Samba and its older cousins to make it worth it. 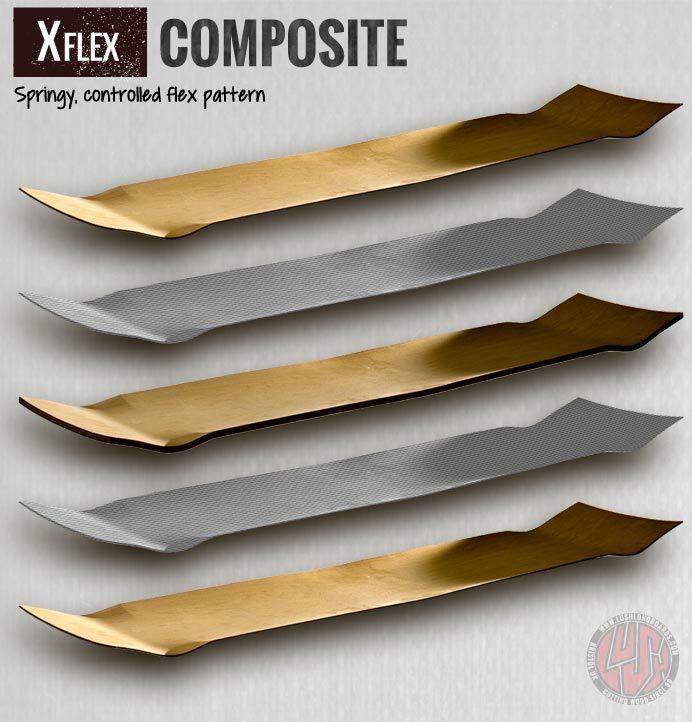 The deck is way flexier and bouncier, thanks to it's X-Flex construction, which gives much better energy return. It's shorter and easier to throw around than the older Samba's. And the new Sabre truck setup feels a lot smoother than the older Seismics. If you've got an old Samba, chances are your board is at least seven years old anyway... time for a fresh setup! 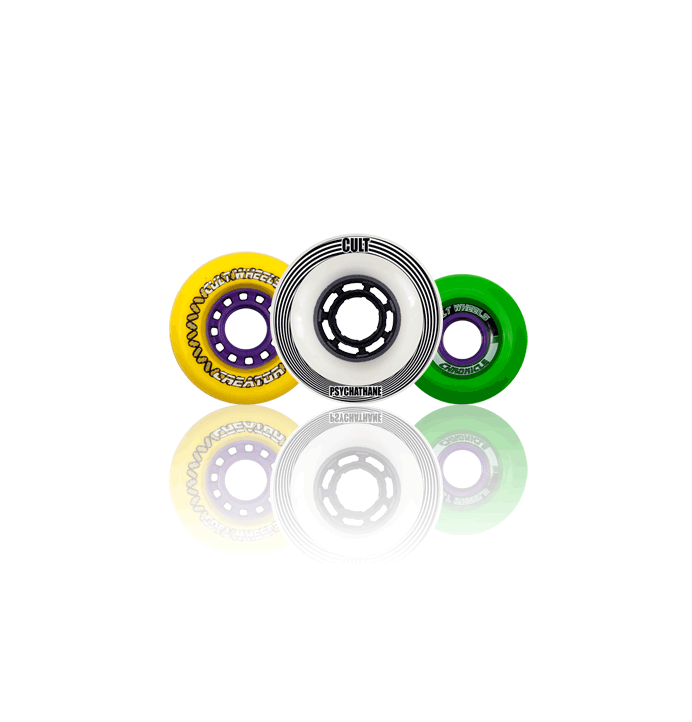 Question: What alternative wheels do you recommend for the Samba? - You want something as grippy as possible! We ship this with Cult Emperors (Pro complete) or Raptures (Elite complete). To be honest, we think that the Raptures are really worth the extra spend, as they are a lot grippier than the Emperors. 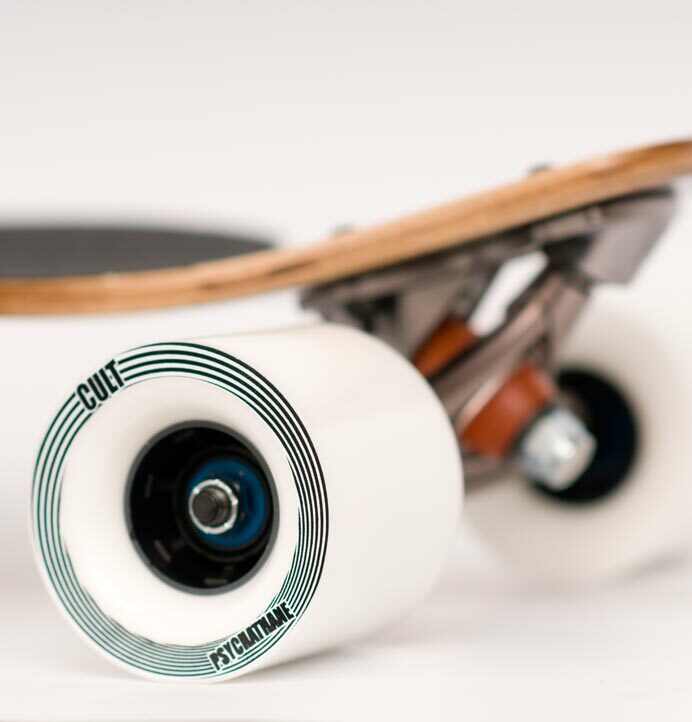 Any big, wide downhill wheel with a lot of grip will be good - but don't go bigger than 75mm otherwise you'll get wheelbite. 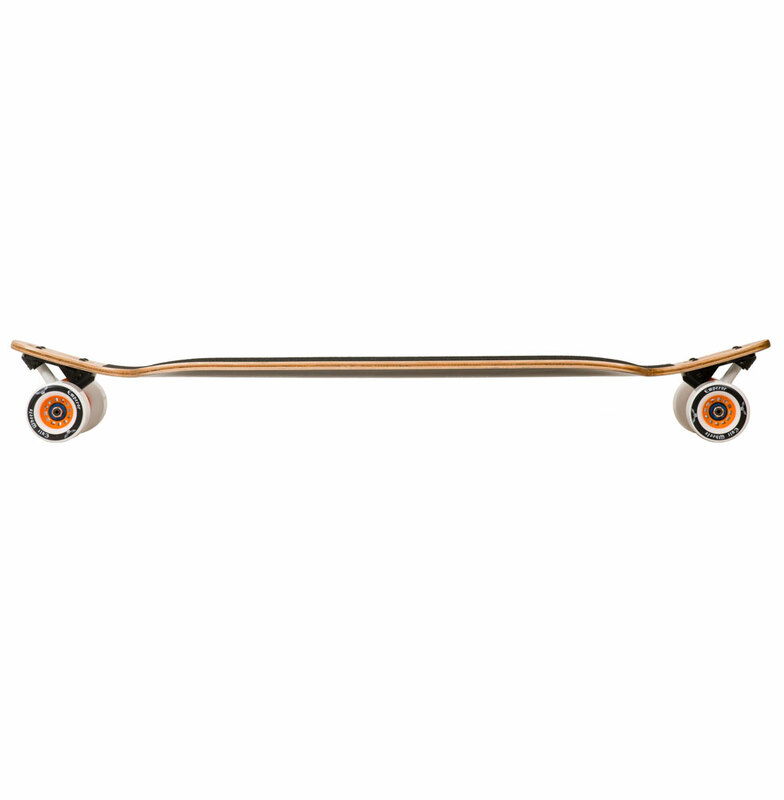 Something a bit smaller like a 70mm Landyachtz Biggie Hawg might work, but they're centerset, so again watch out for wheelbite! So our official recommendation remains Cult Raptures, but if you really want to try something else, keep it under 75mm, and make sure that you choose an offset core. 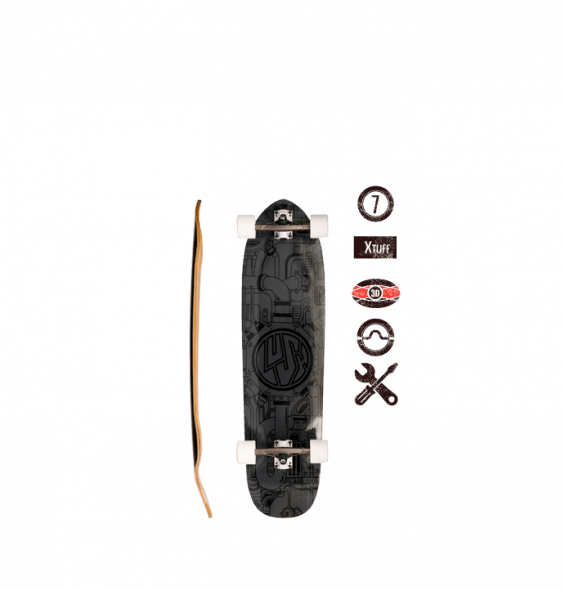 Question: Can you use this board for downhill if you put harder bushings in? - You'd think that the super-low ride height and low angle trucks would make the Samba amazing for going fast on. And you're right - except that the deck is very, very flexy. If you were to put harder bushings in and bomb a hill, you'd be fine until you got to a corner and tried to track a line. 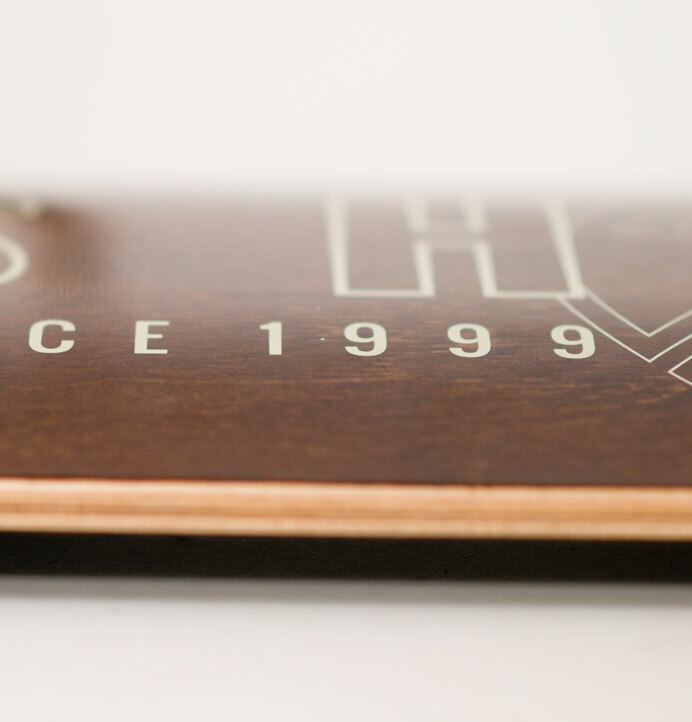 We recommend a stiffer deck like the Machine 3D X-Tuff or Grifter if you want to skate fast! Question: How does the Samba ride vs the Loaded Icarus? 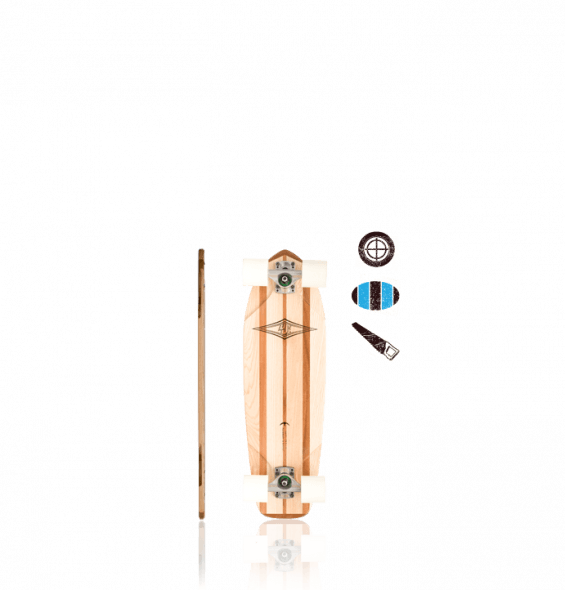 - Despite both being "Carving longboards," the Samba and the Icarus get there quite differently. Both feature wood/glass constructions to give a good energy return, but that's about where the similarities end. 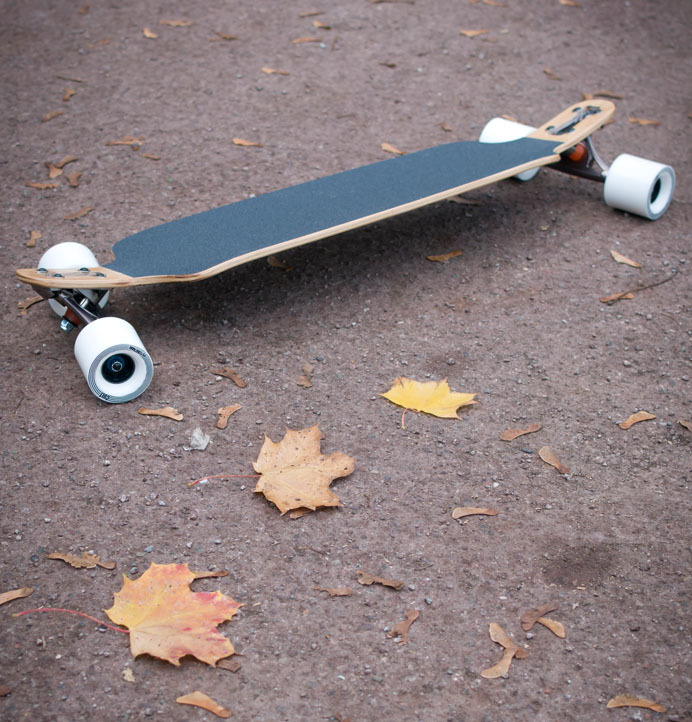 The Loaded Icarus is a drop-through board, whereas the Samba is a drop-up board with lowered riding platform - so it's a lot lower to the ground, which means more sliding control and an easier push. 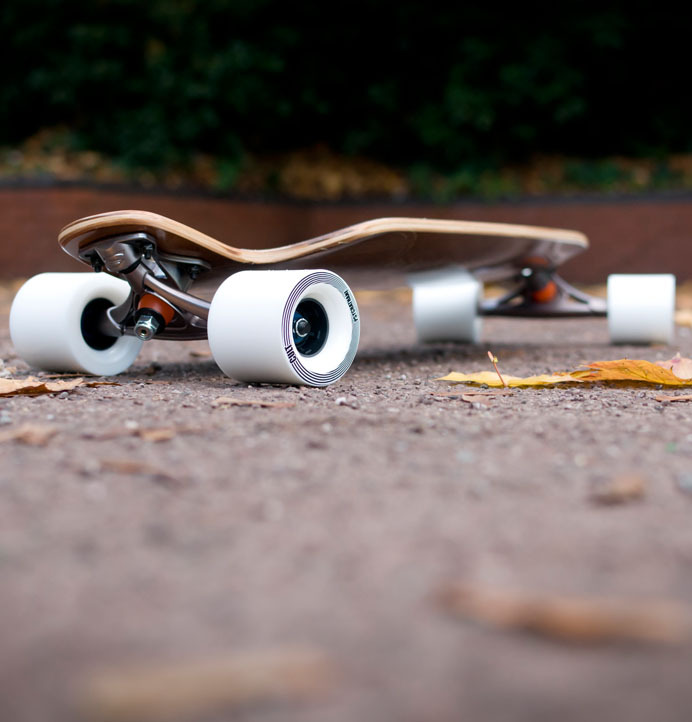 The Loaded Icarus has a much more complicated concave, with wheel flares to prevent wheelbite and provide reference points for your feet, whlie the Samba is dropped-down with huge wheel cutouts - so it doesn't really need the 3D concave that the Loaded has. The Loaded Icarus has small kicktails, which the Samba lacks - so you could do some dancy stuff on the Loaded, but if that's what you're into then you're better off checking out the Symbian 3D or the Freebyrd. 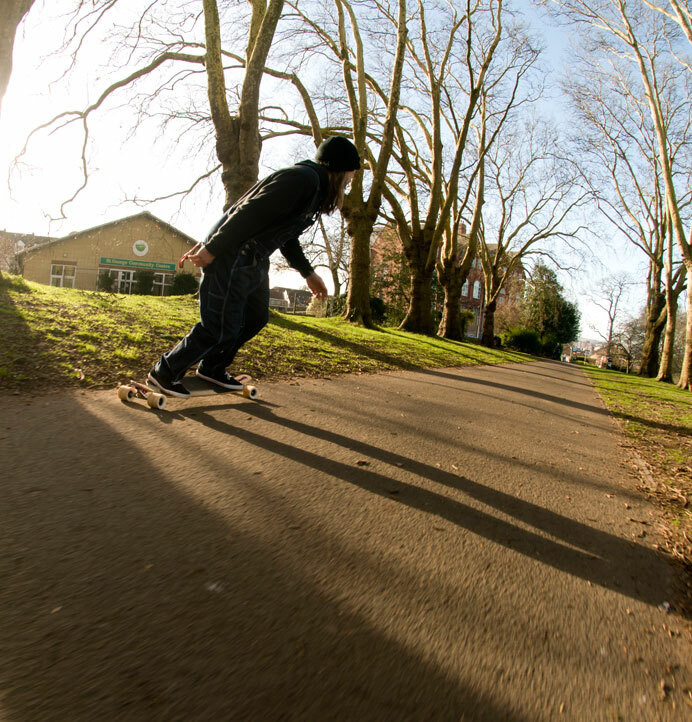 The Samba is built to carve and nothing else! 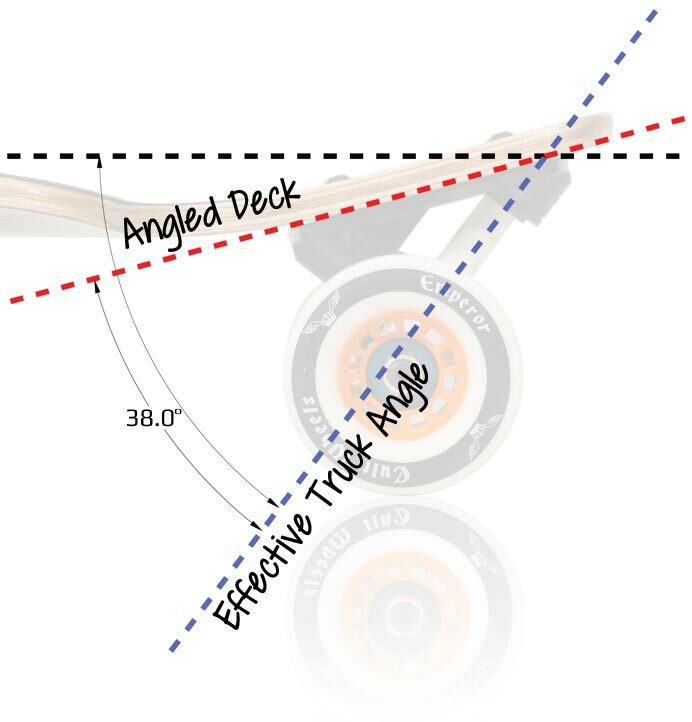 You can put any trucks you like on a Loaded Icarus - but this does mean that the deck isn't optimised for a single truck setup like the Samba, so if you're just looking to carve like crazy, the Samba will turn a lot harder and faster. 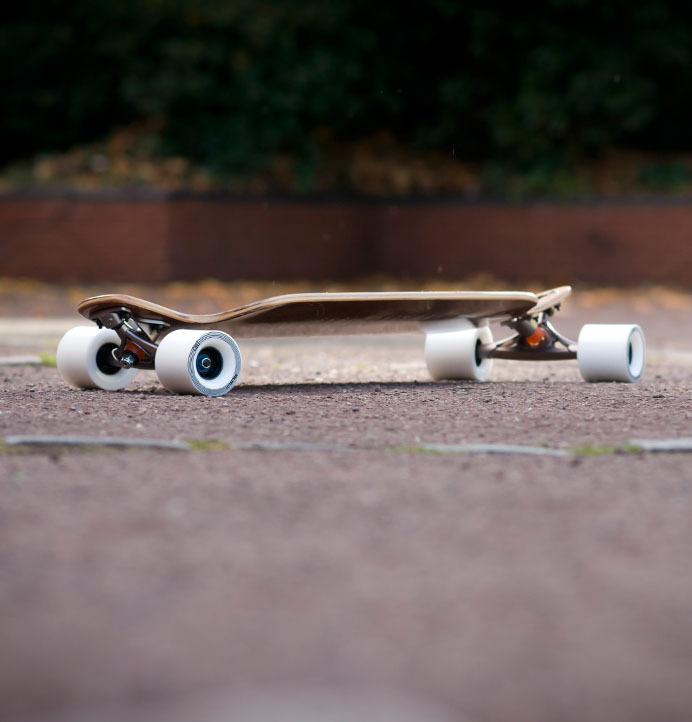 They're both built to carve, but out of the box, the Loaded is more of a general cruising setup, whereas the Samba is all about turning so hard your face melts! Question: Is it better for town cruising them Symbian? - These are two quite different decks. The Symbian is much stiffer, and has kicks for dancing and freestyle moves. We'd recommend it if you want to do some dancing or learn some sliding down your local hill. The Samba turns a lot more and has a much nicer flex - so if cruising around and carving is your aim, the Samba is a way better bet.